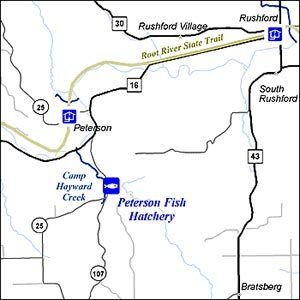 The Peterson State Fish Hatchery is located in Southeastern Minnesota in Fillmore County near the town of Peterson. The Peterson Hatchery produces Lake Trout and Splake Trout annually for Minnesota's Cold Water Trout Program. Our trout are stocked into cold, deep water lakes throughout northern Minnesota near the towns of Hinckley, Grand Rapids, International Falls, Tower and Grand Marais. Fish are stocked as 4" fingerlings in fall and as 8" yearlings in the spring. Peterson Hatchery also maintains a captive lake trout brood stock, which provide eggs for each years fish production. Self-guided tour: Due to spring construction, we will be open May 1 through October. Hours are 7 a.m. - 3 p.m. on weekdays and 7-11 a.m. on weekends. Guided Tour: Available by reservation by calling 507-875-2625.